Me on my graduation day! The ESOMAR Foundation is pleased to announce the awarding of a scholarship to Maria Paola Loy Villagran, a young student at the Master’s Degree in Marketing at Universidad Rafael Landívar, Guatemala. This initiative falls within the scope of the ESOMAR Foundation’s education program whose purpose is to give financial support to individual students from disadvantaged socio-economic backgrounds with an interest in pursuing a career in market research. The scholarship has been awarded after a careful evaluation of the motivational and socio-economic background of the applicants from an independent jury composed of experts from the market research industry. The ESOMAR Foundation is happy to support Maria Paola in her studies and hopes that this scholarship will make a difference her life and her career efforts. 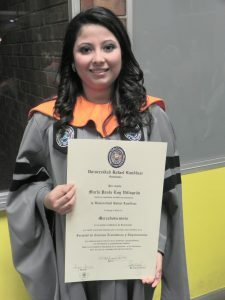 Maria Paola is a student at the Master’s Degree in Marketing at Universidad Rafael Landívar in Guatemala. Maria Paola has several aspirations . The first one is, never stop growing in the professional field of marketing, keep learning, searching for new trends to stay up dated, in order to understand her customers, learn about their needs and help to implement either at work or in her own company the best strategy to increase sales. In financial terms, she would like to earn enough to reach a stage where she can start her own business without feeling any financial pressures so that she can simply concentrate on her work, do what she loves and give a comfortable life to her mom in the future. In personal terms, being flexible and adaptable to changing conditions in her life. By just getting through each day, one day at a time and fighting for her dreams. Living each experience of her life like it is the last one. And hopefully help others in her country to succeed and grow.